The view stretches out 300 kilometres across the Himalayas. In the centre is Mount Everest (8848 metres); Lhotse (8516 metres) is to the right. MACS, the specialised apparatus developed and built by DLR, is fitted in an unpressurised instrument container mounted beneath the wing of a Stemme S10-VTX motorised glider. The Stemme S10-VTX glider has a retractable propeller mounted on its nose. The University of Applied Sciences in Aachen contributed the aircraft for the expedition. From left to right: René Heise, Daniel Hein, Jona Keimer, Klaus Ohlmann, Jörg Brauchle, Heiderose Häsler. Soaring up towards Mount Everest (8848 metres, centre-left, rear), with Nuptse (7861 metres) in front. A team of German pilots from the Mountain Wave Project (MWP) and researchers from the German Aerospace Center (Deutsches Zentrum für Luft- und Raumfahrt; DLR) have achieved a groundbreaking feat around the highest mountain on Earth. 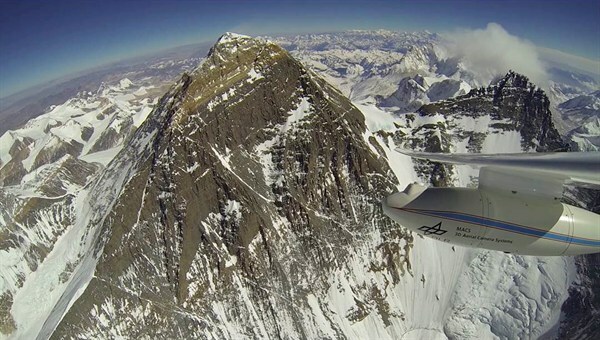 For the first time, they flew to the summit of Mount Everest, 8848 metres above sea level, in a motorised glider – taking with them a special 3D camera, the Modular Airborne Camera System, or MACS. This innovative camera system, developed as part of DLR's focus on technology for security, has been designed to provide the data required to produce a remarkably precise 3D model of the Nepalese Everest region with a resolution of down to 15 centimetres. These images will help improve forecasts of landslides and floods resulting from the outbursting of glacial lakes. Record-breaking MWP pilot Klaus Ohlmann and co-pilot Jona Keimer needed one and a half hours to reach their destination. They took off from the expedition base camp at Pokhara airport in Nepal on 28 January 2014 and flew along the Himalayas en route to Mount Everest. There, they used mountain waves to gradually gain altitude: "The conditions were ideal, despite the wind speeds at the summit of Everest, which neared 100 kilometres per hour," commented Ohlmann. “The almost turbulence-free slope updrafts helped us ascend quickly." While they were focused on flying, DLR's MACS went about its scientific business from inside a pod on the underside of the starboard wing. DLR project manager Jörg Brauchle was thrilled at the flawless performance of the 3D camera system at altitudes exceeding 8000 metres: "The pilots did a fantastic job. We were able to fly over all the planned areas in the Nepalese Everest region – including the famous escape route between Lukla and Mount Everest – in 90 minutes." Brauchle and his colleagues from the DLR Institute of Optical Sensor Systems can now, step by step, create computer models of the Khumbu Valley and the adjacent glaciers. "The Khumbu Valley is of particular scientific interest to us because this is where our international partners from the International Centre for Integrated Mountain Development (ICIMOD) operate their test areas and where they have been, for many years now, analysing the slopes and glaciers." They provide valuable comparative measurements for the recently acquired 3D images. Glacier researchers can now draw on the highly accurate 3D data to produce comprehensive and accurate analyses for civil protection. MACS, the specialised apparatus developed and built by DLR, is fitted in an unpressurised instrument container mounted beneath the wing of a Stemme S10-VTX motorised glider. 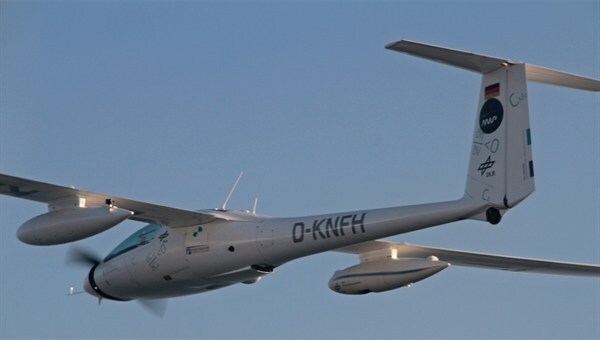 The Faculty of Aerospace Technology at the University of Applied Sciences in Aachen supplied the research aircraft, making a substantial contribution to the expedition. Designed to withstand bitterly cold temperatures above the Himalayan summits, which dropped to below minus 35 degrees Celsius, the camera must operate without loss of functionality in extreme conditions. For this reason, this special DLR apparatus underwent a series of rigorous tests before its first deployment, including tests in a vacuum chamber, at moderate altitudes above the Alps and while subjected to unusual lighting conditions. The camera system's imaging technology has been specifically designed to handle the special challenges encountered in high mountain regions. Three camera heads, arranged facing toward each other at a lateral slant, provide a 120-degree field-of-view and permit acquisition of high-resolution images of steep slopes. The pictures are used to create detailed computer images – in 3D and colour – of the mountainous regions the glider passes over. DLR has its own software to do this, which it also uses to evaluate data acquired with Earth observation satellites. "Steep mountain slopes pose the greatest challenge in data processing," explains Brauchle. The 3D model can be integrated into a geographic information system (GIS), opening the door to analyses and evaluations that take into consideration geological, hydrological and meteorological data with respect to the hazards posed by these steep slopes, as well the wide expanses of glaciers covering remote and inaccessible mountain regions. Upon landing, following the successful research flight to Mount Everest, the researchers teamed up with ICIMOD to analyse the initial findings and discuss ideas for furthering this fruitful cooperation. "It might be an immense organisational and logistical challenge, but we were able to successfully complete the project within an extraordinarily tight time window," says René Heise, director of MWP. "The pilots and other equipment are safe and sound." To conduct flights in the vicinity of the world's highest peaks, a tried and tested oxygen system accompanied the pilots on board the glider. The first 3D models of the imaged Everest region will available in the coming weeks. The researchers are keeping a blog to provide additional details of their adventurous research expedition to the Himalayas.